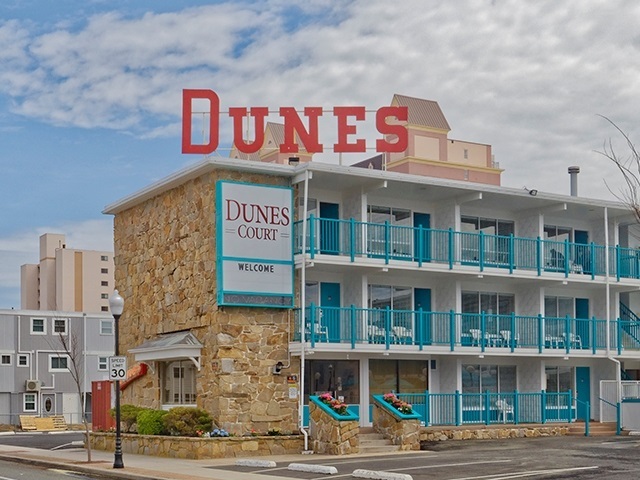 Exclusive Dunes Court Sale - $50 per night in the month of April when you stay two nights or more at the Dunes Court Building. Cancellation Policy: Reservations cancelled from the time of booking to 72 hours (3 days) prior to arrival will forfeit a $25.00 service fee. Reservations cancelled within 72 hours prior to arrival will forfeit one night's room and tax. 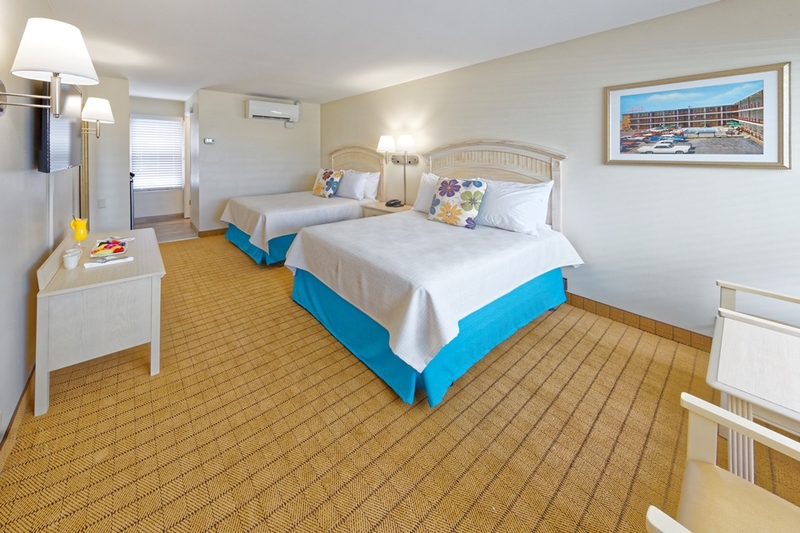 Fun abounds at the casual Dunes Court at the northern tip of the famous Ocean City Boardwalk where all accommodations overlook the outdoor pool, each with semi-private balcony or patio, 48" HDTV, two double comfort beds, complimentary Comcast fiber WiFi and a fresh new hip look. Enjoy the comfort of this airy extra-large guest room offering two double beds microwave, refrigerator and in-room safe. This guest room is spacious and provides ample closet space and a relaxing seating area. Located at the corner of Baltimore Avenue and 27th Street, convenient check can be found at the Dunes Court on-site office with complimentary coffee and ice available offered daily. At the Dunes Court you will find ample off-street parking, outdoor pool and daily housekeeping service allowing for a fully relaxing stay. Enhance your stay and take advantage of the amenities of the Dunes Hotel at 28th Street and Baltimore Avenue, such as daily Afternoon Tea from 3pm – 4pm, an indoor/outdoor pool and deck, restaurant, bar, verandah, complimentary morning coffee and sing-alongs on scheduled evenings. This guest room also contains a refurbished bathroom with refreshing bath amenities. Additional features include an alarm clock radio, black out curtains, iron & ironing board and outdoor seating area.